After seeming to appear from nowhere with an EP which was capable of absolutely levelling listeners even if they did see it coming with pure unadulterated Riot Grrl power last year, it’s unlikely that fans of Baby In Vain expected to see a full-length album appear so soon – but the band is not only back with a full-length album now, they’ve found ways to further refine their sound in fantastic ways on an obviously truncated timeline. The cutely/coyly entitled More Nothing doesn’t exactly assault listeners as hard or as obviously as the For The Kids EP did, but the album does prove that Baby In Vain still has venom in them to spare; between these eleven tracks, the trio spills gallons of venom and vitriol all over listeners, but tightens the arrangements of each song as well as fine-tuning their performances to not rely on distortion so much which lets the writing and style really shine through. The difference in style and overall performance between For The Kids and More Nothing is instantly apparent as the album opens with “To Heaven And Back.” Literally from note one, listeners will be able to recognize the crunchy guitar tone which dominates the song as familiar, but it’s not quite as heavy or jagged as it seemed to be on the group’s previous outing. Rather, the guitars feel a little smoother and polished than before, and the dichotomy of the vocal performance which accompanies them feels like a revelation; Lola Hammerich takes the lead in the affair and near spits every syllable in every stanza while Andrea Thueson follows in a decidedly more Pixies-esque manner by offering backing vocals and singing more absently and melodically. The differences found here between More Nothing and For The Kids are obvious and reasonably modest in the grand scheme of things but, in listening, the significance is unbelievable; the sound on “To Heaven And Back” is far more streamlined and smooth than any performance found on For The Kids, but no lighter or less caustic – the balance struck is an unlikely one, definitely compelling. After “To Heaven And Back” lets out, listeners will be left glowing by the experience and find that Baby In Vain does nothing with “Transcendent” other than make sure listeners know that nothing about how this album opened was a fluke as they recreate the exact same grungy/Riot Grrl aesthetic again and pound it home once more. Basically repeating themselves as they do is a bold step, no question, but it’s also a very, very strong one; being a second release in less than twelve months, every fan will just bet on the album being more of the same by default but shifting the focus and then making sure listeners can’t miss that fact is both an energizing and confident play; here, Baby In Vain is almost petulantly waiting for listeners to catch up with them before they move on, and when they do make their next move, they do so peerlessly. With standards set, Baby In Vain then begins poking around track-by-track to see where they can expand their boundaries still further. On “Low Life,” the band gets moody and expands in an almost hymnal and balladesque direction (complete with a lonesome-sounding sax) before tipping their hats toward both Sleater-Kinney and The Meat Puppets with the classic rock/indie hybrid known simply as “She” and then feeling a great amphetamine rush from “Pills” before melting down in the finest, most perfectly over-the-top manner on “Thank You.” In that particular instance, there’s almost no doubt that the track was written to be filler as all the bandmembers break down laughing more than once in the song’s two-minute-forty-five-second running. 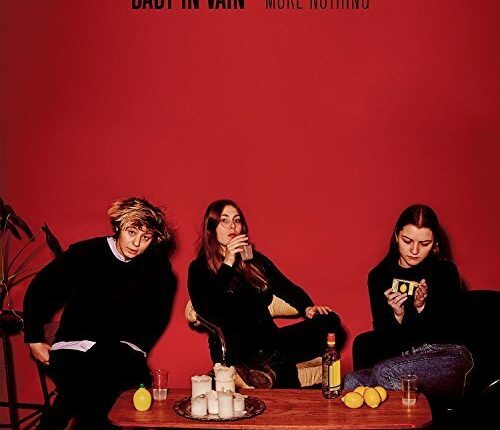 It might sound bizarre, but that caustic, acidic little nugget might just be the best molten mass on this record; by turns, all three members of Baby In Vain take an opportunity to go flying over the top as they shift back and forth between scraping, savage, bluesy guitar parts, percussion which nearly lives in clip and a vocal which screams incoherently before drooling a bit of nonsense for good measure. That it works as well as it does speaks directly toward just how good the band as gotten, and how fast they’ve done it; there isn’t much question that “Thank You” is really just supposed to be a silly, sugarcoated “mania workshop,” but Baby In Vain manages to wrack the song up so it sounds like they’re just goofing off and having fun. It’s a great light way to end the CD and, after they’ve heard it, listeners won’t stop grinning a big, goofy smile until the album actually ends, two songs later. More Nothing is out now on Partisan Records. Buy it here on Amazon.